Busy with work, kids, projects, life in general… perhaps all of the above? There is nothing easier from the prep all the way down to the clean-up, than a one pot meal. If that wasn’t fantastic enough, one pot means all of the flavors you add to the pot, stay in the pot and only build and intensify as it cooks. Feed your belly and comfort your soul in one pot. What’s more satisfying than that? As some of you may know, we recently moved across the country to the Bay Area. I’m one of those crazy people that can’t stand to have things cluttered and in disarray, so I will not stop until everything is back in its place. Yes, I am that person. Which means that from sunup to sundown while Mr. HapaNom was away on business, I was unpacking – 15,000 pounds of household goods. ‘Just wait until I get home’, my husband would plead. But my obsession for tidiness would not allow me to wait. 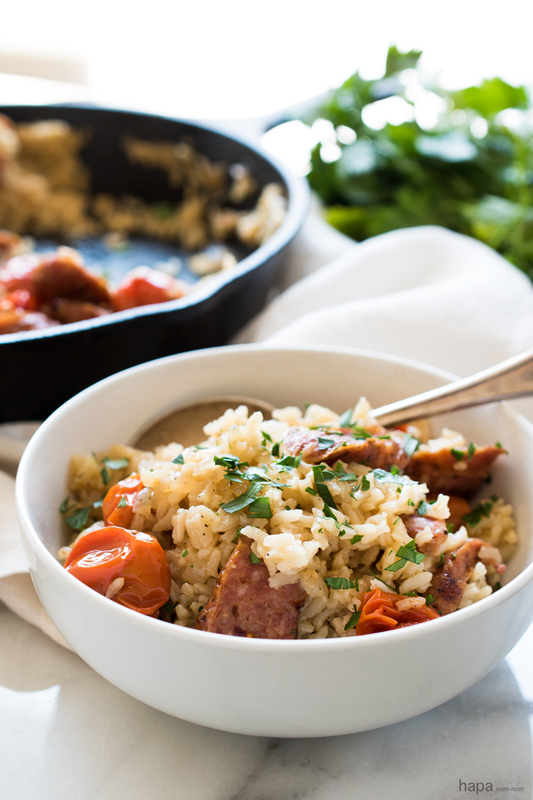 I got through it with lots of wine, the antics and comedy stylings of Arlo and Otis (our dogs) and quick meals like this Easy One Pot Sausage and Rice dish. 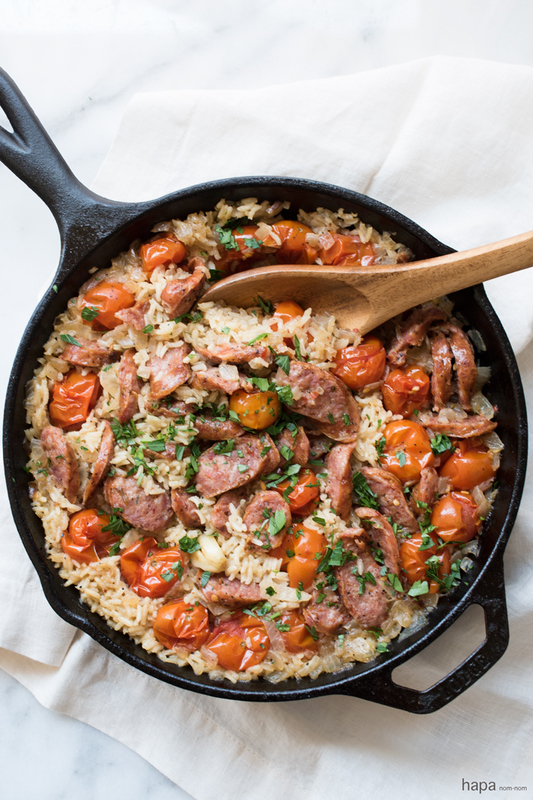 One skillet, 30 minutes, easy clean-up, and delicious - what could be better than this Easy One Pot Sausage and Rice?! Preheat the oven to 350 degreed F.
Add the olive oil to a large oven-safe skillet (cast-iron, if you have it) and warm over medium-high heat. Using a fork, prick the sausages and add to the pan. Turn to brown, about 2 minutes per side. Remove and once cooled, slice into ¼-inch coins. (Do not wipe out the skillet). Add the smashed garlic and cherry tomatoes. Stir in the rice and add the chicken broth. Add the crushed red pepper if desired, and season with salt and pepper to taste. Stir in the sliced sausage and bring the contents of the pan to a simmer. Cover and place in the oven for 20-25 minutes. Remove from the oven and allow to rest with the lid in place for 5 minutes. Carefully remove the lid with an oven mitt and garnish with chopped parsley, serve and enjoy! Ooh man! This was really good and all of my kids including my 2 year old loved this and my 11 year old had seconds. Thank you so much for a family friendly meal that’s not only one pot (any excuse to use my cast iron) but pretty and delicious as well, I will be making your recipe at least twice a month! Hi I don’t have a skillet that’s oven proof.. could I just transfer it to a oven proof dish and cover with tin foil while it bakes? Love a one pot meal. This will be perfect for when things get crazy busy in September!! One pot meals are actually one of my favorite things to make! Since I have no dishwasher, doing the dishes on regular meals (or even baking!) can take forever! I totally know what your saying, Cathleen! There was a time I didn’t have a dishwasher either, and anything that could cut down on clean-up afterward was definitely appreciated! I made this last night but with chorizo as that is the only sausage I had to hand. It was so easy and tasted great, thank you. Hi, Ann! I’m so glad you enjoyed the dish! 🙂 Chorizo sounds like a fantastic pairing and a great way to add some heat. Kathleen, you know I am a one pot rice gal! This looks so flipping good! MY god! I am in love!!!! And I always think that I am one of those gonna get shiz organized immediately type of gals..and then I get side tracked like an ADD puppy 🙂 And run around doing one thing to the next!!! Lol! I know exactly what you’re talking about! I actually stayed pretty focused this time with unpacking, however if I’m doing something tedious like re-organizing a closet, I get SO side-tracked! I’ll find something like an old picture and then I feel the need to dig out other pictures and reminisce. Before I know it, not only are the closet contents all pulled out, but now so is the photo bin in storage. I totally have ADD when it comes to stuff like that! Yes yes totally!!!! I do that with pictures all the time!!!! I even do it on my phone 🙂 I’ll be looking for a picture and then I see other pics and I get side tracked… Such a nightmare! Yum, it looks divine! I love one pot meals. I’m with you on the clutter. I hate having things all out of place and disorganized. I can’t focus or function like that! Thanks, Mira! It had actually been awhile since I last cooked with sausage too – oh my, I forget how tasty it is! 😉 My mom just tried the dish with turkey sausage and love it! I’m with you, I am totally THAT girl that has to unpack the boxes and get everything organized as soon as possible too. One pot meals are such life savers especially when you are in the middle of a move 🙂 Love all the flavors in this easy skillet meal, it looks so comforting and delicious! I’m so to know that there are other people out there that can’t relax until everything is organized! It makes be feel way less neurotic 😉 One pot meals have been a life-saver since moving! OMG! I am so THAT person too!! Everyone keeps saying take your time, and I’m like, ” But the boxes are making me CRAZY!!!! !” And my hubs works A LOT so it’s all on me as well. I wish we lived closer, because you, me, our dogs, and a few bottles of wine would make it all good!! 😉 I’m (obviously) TOTALLY digging your one pot wonder! Hearty, delicious, fabulously flavorful = Gimme some of dat!!! Love this! Pinned! You should name this dish the sanity saver. Lol 😉 Cheers, pretty! It would be so awesome if we lived closer – we could unpack and loose our minds together! My favorite kind of meal! Feeds my belly and comforts my soul…I’m in! Beautiful dish, Kathleen! I love 30-minute one pot meals. They are a life saver and not to mention delicious.The rice, sausage, and fresh tomato combo looks yummy! I don’t blame you for wanting to get things in order ASAP. Having a house in disarray really elevates my stress level. Kathleen, I can really relate to your wanting everything put away in your new home. When I was younger I moved a lot, and always made sure I did not go to bed until everything was put away, except pictures on the wall. I think that for me, besides being able to find what I needed, it also helped me to feel at home in my new place. The last time I moved was 7 years ago when I got married, and it took quite a while to settle into my husband’s house. But by that time it was okay to do it slower. 🙂 This recipe sounds wonderful. I like simple and one skillet. This is something I’d try making in an electric skillet, and I’m sure it would work well that way. Glad you’re settled in, and I hope you enjoy San Francisco. I think that for me, besides being able to find what I needed, it also helped me to feel at home in my new place. This dish is so me, Kathleen! Love the one pot and it’s a great way to use up the cherry tomatoes from my CSA this week. 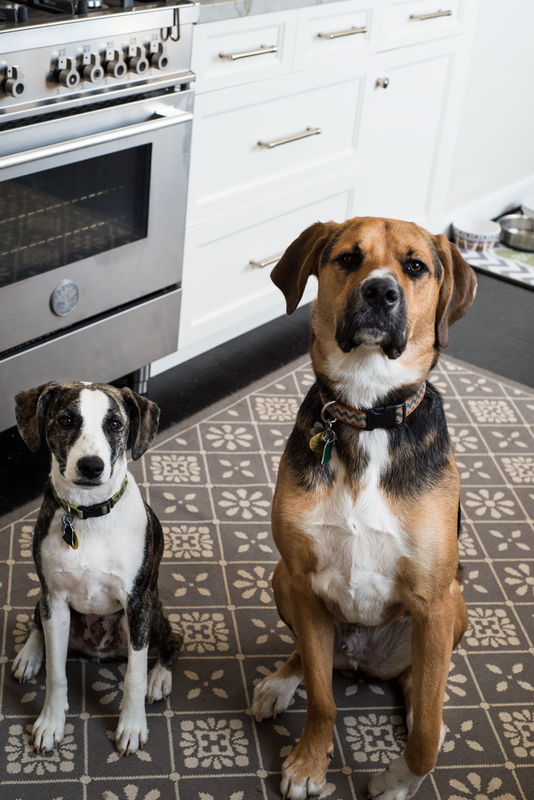 Your helpers, Arlo and Otis, are too cute! I couldn’t get anything done with those two around because I’d have to keep stopping to hug and kiss them repeatedly 🙂 BTW, I’m one of those people too who can’t rest until everything is put away and in it’s right place. Delicious one pot meal Kathleen! Loving the addition of bursting tomatoes! 15,000 metric tons of kitchen supplies does seem a tad high there is nothing better than having 2 of mans best friends by your side to help you get that sorted. Pinned!